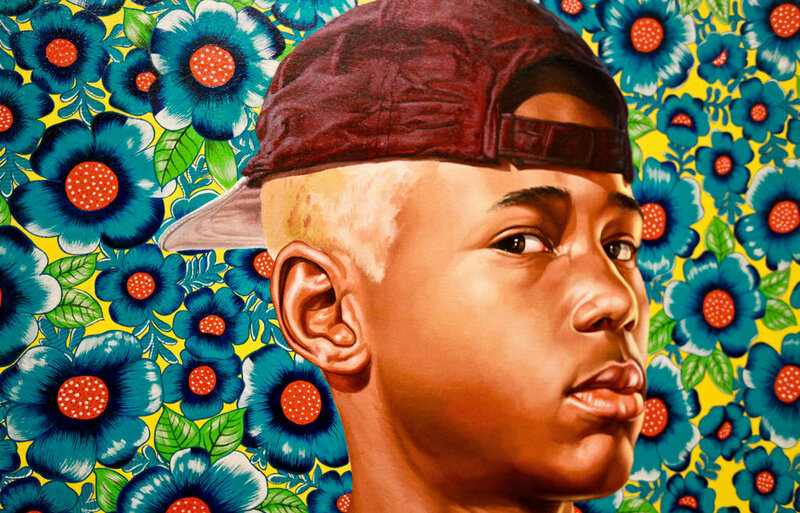 The plant-inspired backgrounds to Kehinde Wiley’s (b.1977) portraits are decorative devices to displace the subject from their expected environment. This helps us lose some of our preconceptions, allowing us to see better. Plants being plants, they do a whole lot more than that. They play with stereotypes of young black male masculinity and sensitivity, highlight the class and grace of women, and engulf and lift-up with intimacy and beauty the uniqueness of every individual face he paints. His subjects copy poses Wiley finds in old books and artworks of rich, powerful and colonial Europeans; inverting the place and role of black people in history. Each piece a cultural inquiry and a social commentary. Critics talk of the flatness of the background compared to the depth of the figural and hyperrealistic foreground, but that’s why it works. The shapes and colours of the plants are so dynamic, even when one-dimensional, allowing them to form a significant, yet supporting role in the power of his art. A retrospective of the artist’s work The New Republic can currently be seen at the Brooklyn Museum. A video below shows the artist eloquently explaining his life’s work to date. Runs to May 24th 2015.